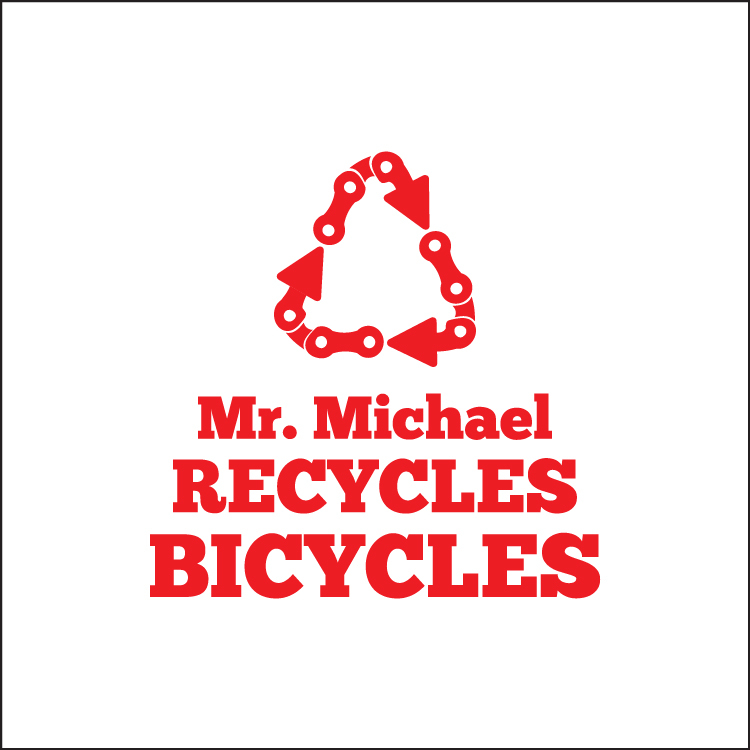 Mr. Michael Recycles Bicycles – "The Ultimate Bike junkyard"
The Calendar is now at the bottom of this page. Please note that we have more kid size bicycles than we are able to use, so we request you bring these to the Free Bikes 4 Kidz collection on October 6. We always accept bicycles to fit tall people – 5’10” and above – especially mountain and hybrid styles. We especially need bicycles to fit very tall men. Thanks. 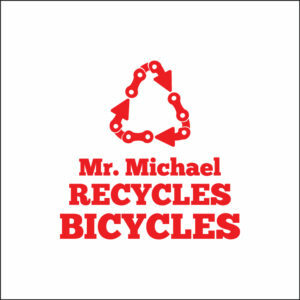 Who is Mr. Michael Recycles Bicycles? MMRB is a private company that gives away bicycles. It is run on a break-even basis by Michael and Benita Warns. No one receives a salary. 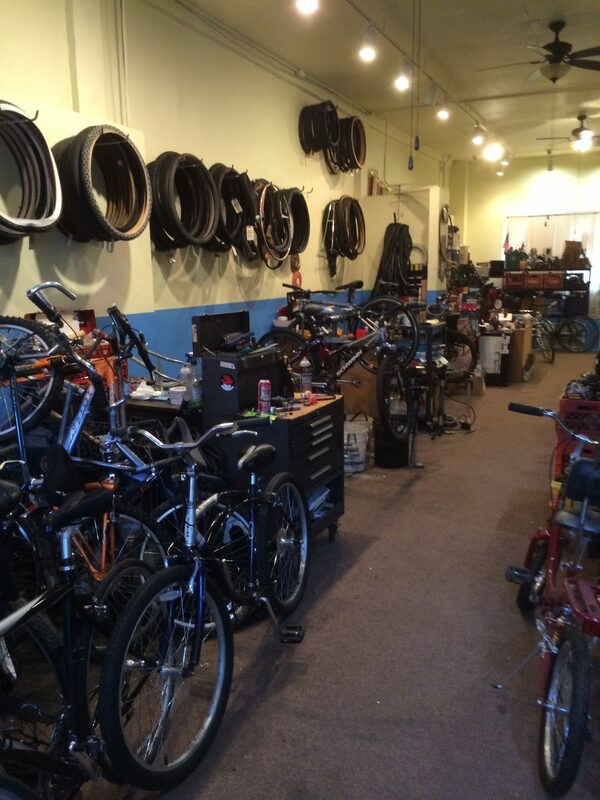 MMRB gathers discarded bicycles, repairs them, and gives them away. 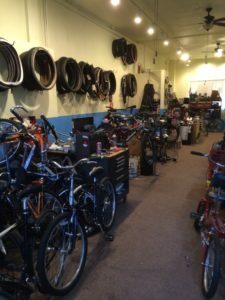 MMRB also offers repair services with a labor charge of $20 per hour plus parts, and sells a variety of used parts and accessories, as well as a limited number of used bicycles. Where does MMRB get the bicycles? MMRB volunteers go to community recycling events and gather the reusable bicycles brought in. People who have a bicycle they no longer need can contact MMRB directly. A small donation is welcomed to offset disposal expenses for worn tires and other non-recyclable parts. When can people contact MMRB? Anytime via e-mail at info@mmrbstore.com, or telephone 651-641-1037 between 9 AM and 9 PM and leave a message. Please note that we are making changes to our phone system so if you don’t get through right away, please try back again. Why doesn’t MMRB make people earn bicycles? 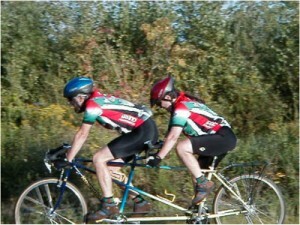 We run MMRB primarily as a ministry, and our calling is to give away bicycles. We do sell used bicycle parts, accessories, and novelty items made from bicycle parts. Sales of these items offset the cost to run the business so that free bicycles are available for those who need them. We do sell some ready-to-ride used bicycles, some bicycles in as-is condition, and higher-end and collectible bicycles. 90% of the money we receive from sales of our products and services goes toward the expenses of the shop, and the remaining 10% is given to charity. All labor is provided by volunteers, and we do not take a salary from this business. How can I get a bicycle? Our wait list is currently open, but we cap it at 60 requests. To get on the list, please call 651-641-1037 during the daytime and leave a voice mail message with your full name, the style of bicycle you would like your height and a reliable phone number we can reach you at when your bicycle is ready. For more information, call Mike or Benita Warns at 651-641-1037, or e-mail them at info@mmrbstore.com. Please do not call before 9 AM or after 9 PM. Thanks.